Aarran Racine is targeting a professional football return after a long injury lay-off. 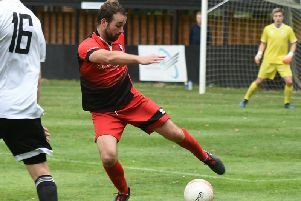 The 26-year-old defender made his long-awaited comeback as a late substitute in Worthing Football Club’s Bostik League Premier Division defeat at title-chasing Dulwich Hamlet on Sunday. Racine’s cameo was the first competitive action he’s had for nearly 14 months after picking up an anterior cruciate ligament injury in his first match of a six-month loan spell at Torquay United last year. The defender was released by Southampton when he was 20 and made the move to now League 2 Forest Green Rovers. Racine had a near five-year stint with Rovers and skippered the side for a short period. Rustington-based Racine left Forest Green last year and was offered a coaching role at Woodside Road. The 26-year-old took up Worthing owner George Dowell on his offer and he is currently assistant manager to Adam Hinshelwood. Racine said: “It’s been a tough year or so but I was relieved to get back out on the pitch. “There were times when I wondered whether I’d ever play again but I’ve had good support and have managed to get back. A large part of my recovery was spent at the Sussex Performance Centre, which was a great for me. “It’s just such a relief to be back out on the field, the focus is on getting my match fitness back and moving from there.” Former professional Racine has every intention of making it back to the level he previously played. But the defender revealed he’s not been in contact with any clubs yet. He added: “It’s still early days in terms of my recovery. Worthing have been a great help and I thank them for everything they’ve done. Current Worthing manager Hinshelwood was forced to call time on his career at just 26 and Racine has been thankful to him for the support he’s shown during his brief time with Worthing. “Adam’s injury was a bit different to mine but he offered me advice and had contacts for me, if I ever needed them,” Racine said. “Myself and Jon (Lock) took the team for a few matches after Gary (Elphick; former Worthing manager) left the club. The focus is on youth at Woodside Road and Racine has been surprised by the ability of a number of Worthing first-team players. Former Forest Green defender Racine sees no reason why the club could not reach the Football League one day. He added: “What George (Dowell; Worthing owner) has done is brilliant. “There’s a real talented bunch at the club right now. Everything is in place for the club to go to the next level. “I think the aim is National League South but I think they could go further than that. n Worthing boss Adam Hishelwood is sweating on the fitness of trio Darren Budd, Ben Pope and Alex Parsons ahead of Saturday’s home meeting with Tooting & Mitcham United.